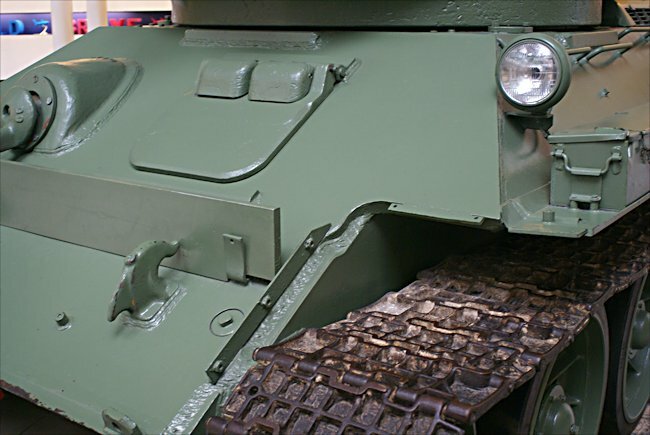 This T-34/85 Red Army Soviet WW2 Medium Tank can be found at the Imperial War Museum, Lambeth Road, London SE1 6HZ. It is only a 4 minute walk from Lambeth North Tube Station. There website is www.iwm.org.uk. 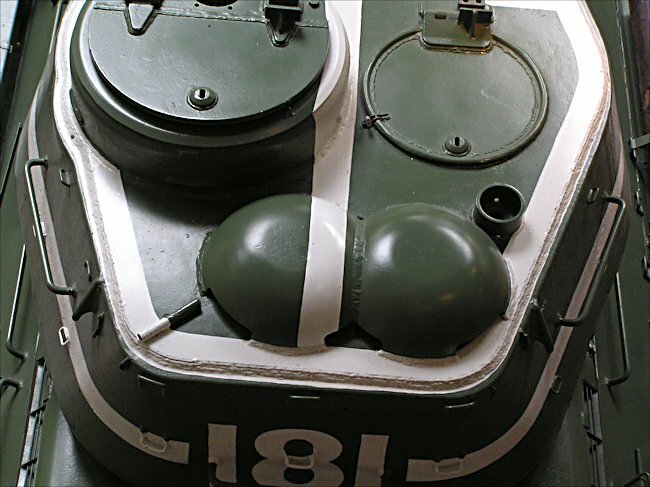 It no longer has the white markings on the turret. 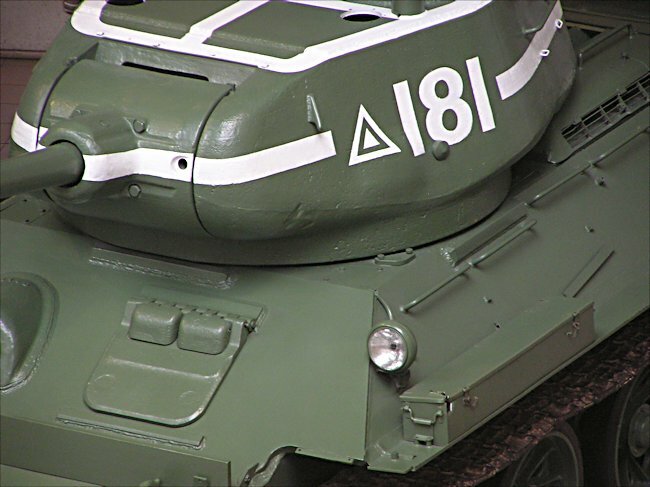 The T–34/85 Russian tank has been in operational service with various armies around the world for over 50 years. 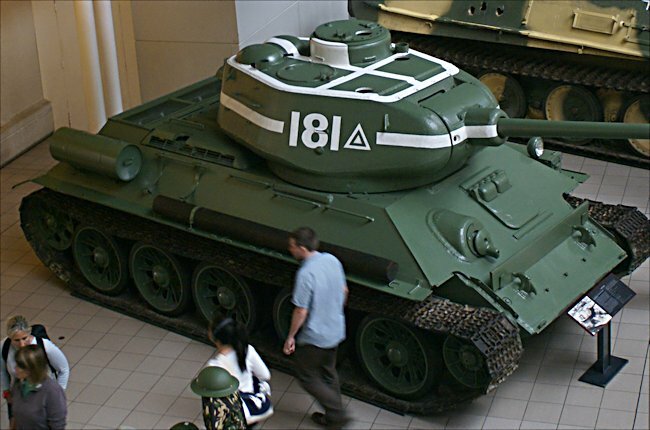 The soviet union first introduced this tank in 1944. The 76 mm gun on the T-34/76 tank was superior to the guns of the German tanks it was fighting when it was first introduced in 1941. But it had problems penetrating the armour of the later German tanks like the Panther and Tiger II Tank. The red Army needed a tank with a bigger gun that was easy and cheap to make. This tank was the answer to those requirements. The Soviet tank regiments started to receive the T-34/85 tank in March 1944. Preference was given to the Guards formations. The idea was to equip the complete unit with the upgraded tank but in reality what happened is that they fought with a mixture the new and the old versions of the T34 tank. T–34/85 tanks were first used operationally against the Germans in the Western Ukraine. The Russian tank crews felt a lot happier fighting the Germans with this vehicle. Although it was not a superior vehicle to the Panther and Tiger tank, they could now at least fight them in a tank that nearly matched them. The major advantage the Russian army did have was in the amount of tanks. they had available. At this time in the war, the might of Russia's industry was churning hundreds of tanks out each month. Trainloads of replacement tanks were arriving every day. Russian tank production at the end of May 1944, was running at about 1,200 T34/85 tanks per month. The German army on the eastern front at the end of May 1944 only had 300 Panther tanks that were operational. Go to end. The Germans were fighting in technically superior tanks but they took a long time to produce. 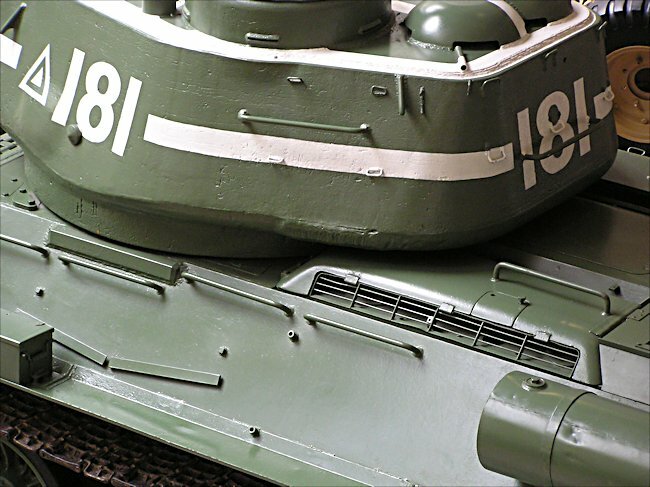 Both versions of the T-34 tank could be manufactured quickly. Losses of tanks could not be replaced quickly. The Russian tank commanders sent wave upon wave of tanks to overwhelm the German panzers. 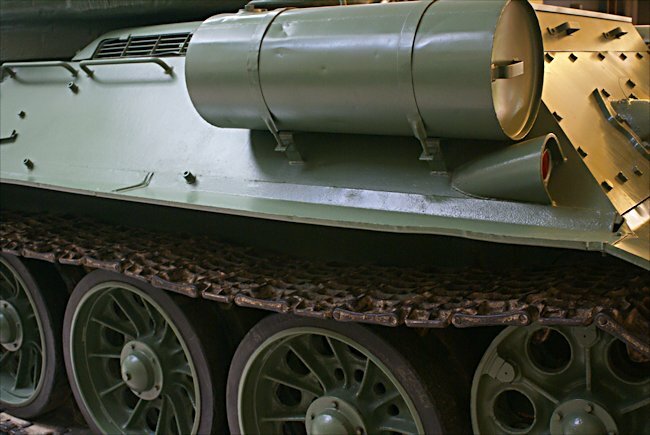 The T-34 tank had a good cross-country speed which meant they could quickly close the distance between the enemy. Because they fought in packs, that meant that whilst the German tank was engaging 1 to 3 tanks in front of it, the others could get around the flank and rear of the tank to fire at its weak spots.